It this courtroom sketch, U.S. Attorney William Weinreb, left, is depicted delivering opening statements in front of U.S. District Judge George O'Toole Jr., right rear, on the first day of the federal death penalty trial of Boston Marathon bombing suspect Dzhokhar Tsarnaev, March 4, 2015, in Boston. Clarke, one of the U.S.'s foremost death penalty legal specialists, told jurors on the first day of the trial the defense will not "sidestep" Tsarnaev's guilt. 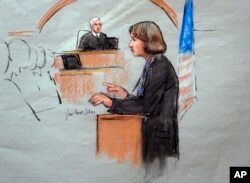 In this courtroom sketch, defense attorney Judy Clarke is depicted delivering opening statements in front of U.S. District Judge George O'Toole Jr., on the first day of the federal death penalty trial of Dzhokhar Tsarnaev, March 4, 2015, in Boston. "It was Tamerlan Tsarnaev who self-radicalized," Clarke said. "It was Dzhokhar who followed him. The evidence will show that Tamerlan planned and orchestrated and enlisted his brother into this series of horrific acts." Weinreb described the two homemade pressure cooker bombs used in the attack as the type "favored by terrorists" because of the mayhem and injuries they could cause. After the blasts, he said, "The air was filled with the smell of burning sulfur and people's screams."